The John M. Olin Library - the academic centerpiece of Washington University in St. Louis' Danforth Campus - will soon undergo a $13.5 million renovation with construction scheduled to start in summer 2016. 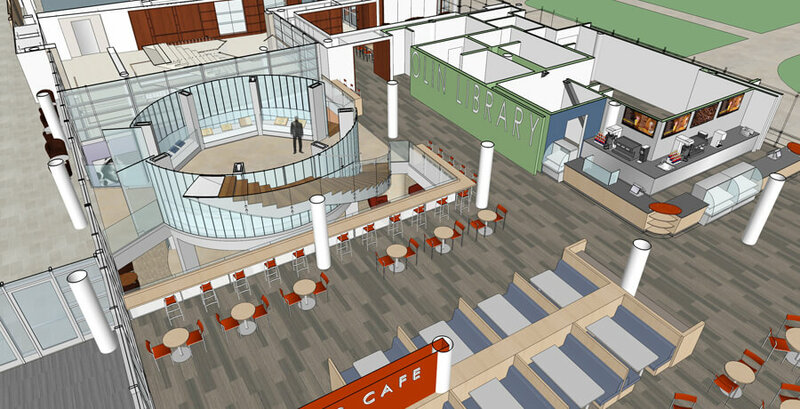 The Olin Library Transformation design effort is being led by Ann Beha Architects (ABA). V Three Studios was selected in the summer of 2015 to work with ABA as the local, associate architect for the renovation of this essential building at the world-class university. V3's responsibilities focus primarily on the design of the expanded Whispers Café; the food service area within Olin Library. With its construction in 1960 and renovation in 2004, the University is further modifying Olin Library into a center for 21st century scholarship by adding extra space for study, exploration, technology and special collection storage. A central feature of the renovation will be the Newman Tower of Collections and Exploration; a four-story glass volume rising within the atrium of Whispers Café. The tower's base will extend down into newly constructed space one level below grade and be anchored by a new "exploration hub" that consolidates emerging information technologies into one highly visible facility accessible to the campus community. The Olin Library Transformation will allow the building to adapt to current technologies and modern library functions while creating new connections between the users and staff and reinforcing the library as the heart of the campus. V3 is pleased to announce being selected to work with Ann Beha Architects as their local affiliate for the renovation of Olin Library on Washington University's Danforth Campus. Construction for the John M. Olin Library started on May 3, 1960 and officially opened in 1962. In 2004 the building underwent a comprehensive renovation and now houses the University Libraries, Reference Desk, Digital Library Services, Special Collections, Writing Center, and the Arc Library Tech Center. The upcoming project will further transform Olin Library, allowing the building to adapt to current technologies, modern library functions, and create new connections between the users and staff - reinforcing the library as the heart of the campus. V3 will be assisting Ann Beha Architects throughout the design and construction of the project.